The following is the schema for a pair of tables to replace the existing project-info.xml system and other database and XML files associated with project data. See Key Definitions for a list of they keys and the data they hold. 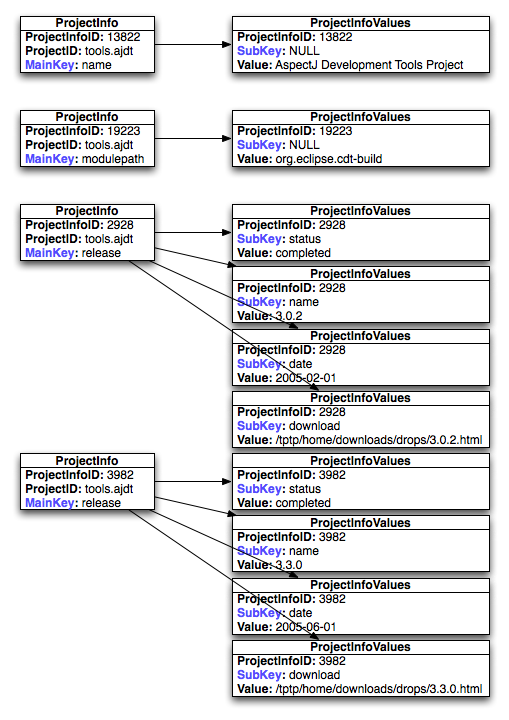 There is a master table (ProjectInfo) which stores all of the keys which link into the sub-table (ProjectInfoValues). The two tables are tied together by an auto-generated sequence ProjectInfoID which is created by inserting the record into the ProjectInfo table. Having a secondary table allows for multiple values to be associated with a single key. The values table can also contain SubKeys as necessary to further classify the value. ProjectInfo can have multiple rows for each MainKey for each ProjectID, and ProjectInfoValues can have multiple rows for each row in ProjectInfo. The MainKeys and SubKeys are highlighted in blue to indicate that these are the values on which you would generally query these tables. The ProjectInfoID is only used as a mapping between all of the values in the ProjectInfoValues table. This can quite easily be queried via SQL. A number of rows together form one record which will need to be assembled as needed by the code calling the query, much as it is today from the XML files, but with a much simpler interface. This function will include the following two classes. This class will gather and hold all of the info for a project upon creation. There is an addition function that will flatten the data for a given ProjectInfoID. This function will return a hashed array of key / value pairs. This class is used to gather a list of ProjectInfo class objects. This class is useful when you want to gather a set or ProjectInfo that meet a certain set of criteria. The main worker function in this class is selectProjectInfoList. selectProjectInfoList(NULL, "mailinglist"); //This will return a list of ProjectInfo objects that have a MainKey = "mailinglist"
selectProjectInfoList(NULL, "categories", NULL, "ENT");  //This will return a list of ProjectInfo objects that have MainKey = "categories" and Value = "ENT"
Once selectProjectInfoList has been called the ProjectInfoList object can be iterated using the getItemAt($i) and getCount() functions. This page was last modified 11:10, 12 September 2007 by Nathan Gervais.